It would not be an overstatement to call turmeric the king of superfoods. Most of us have probably heard about the miracle-root with the golden milk becoming a rage in social media over the last few years. Although some of the benefits of turmeric root have only been scientifically verified recently, it has been used in the Indian and Chinese cultures since thousands of years due to its medicinal values. Turmeric derives its magical powers from curcumin, which has antioxidant and anti-inflammatory properties, making it a great ingredient for smoothies and herbal lattes. However, did you know that turmeric can be especially beneficial in postpartum period due to its healing properties? Let's get into some specifics. Turmeric is known to reduce inflammation, which helps in reducing postpartum pain and soreness. It can also help in preventing clogging of milk ducts by reducing inflammation in breast tissue. Severe inflammation of breast tissue can cause infection and a very painful condition mastitis. Having a healthy dose of turmeric and curcumin can help moms in avoiding it. Curcumin is a strong antioxidant which not only attacks free radicals in the body, but also triggers release of antioxidant enzymes to reestablish the antioxidant/free-radical balance in the body. Free radicals can cause damage to cells, and have been linked to dozens of diseases including arthritis and cancer. Antioxidants can help in protecting a new mothers body from damage and distress, which is already a little weak from birthing. Curcumin, apart from helping the brain with its anti-inflammatory and antioxidant properties, can also help in activating hormones that improve brain function and memory (bye-bye 'mommy brain'). Curcumin has also been found to help with stress, anxiety and depression in some studies due to its anti-inflammatory properties, and helps in regulating hormone levels. Curcumin has been found to be a natural immunomodulating agent, which helps in boosting immunity of the body. Turmeric also has anti-bacterial and anti-viral properties and is rich in minerals like zinc and magnesium which further protect against diseases. A new mother's body also has a weakened immune system, and turmeric can help in restoring immunity naturally. Turmeric is rich in fiber, promotes secretions of healthy digestive enzymes and acts as a carminative by eliminating gases in the digestive tract. This can be very beneficial for a new mother with a weakened digestive system. A warm cup of golden milk or turmeric ginger latte or a bowl of khichari with turmeric also goes a long way in providing warmth and comfort to a new mother. To conclude, although the benefits of wonder-root turmeric are only being scientifically verified now, Ayurveda has been using it since thousands of years as a natural healer. It has been a staple in kitchens of Indian subcontinent, especially for new moms who are encouraged to have a glass of milk with turmeric everyday during their first 3 months postpartum. With all the benefits it has for new moms, it's never too late to jump on the turmeric bandwagon and start including it in your everyday diet. 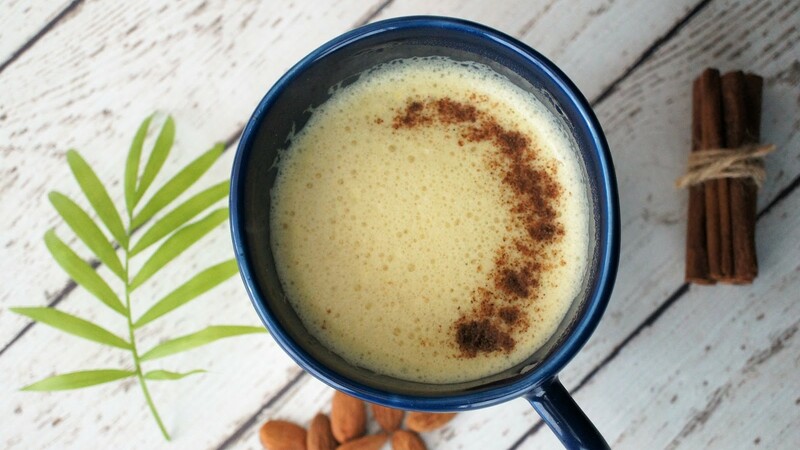 Our expert nutritionists created this next level turmeric latte by adding other super ingredients that just blend so well with turmeric, and make the most delicious cup of golden milk you would have ever had.